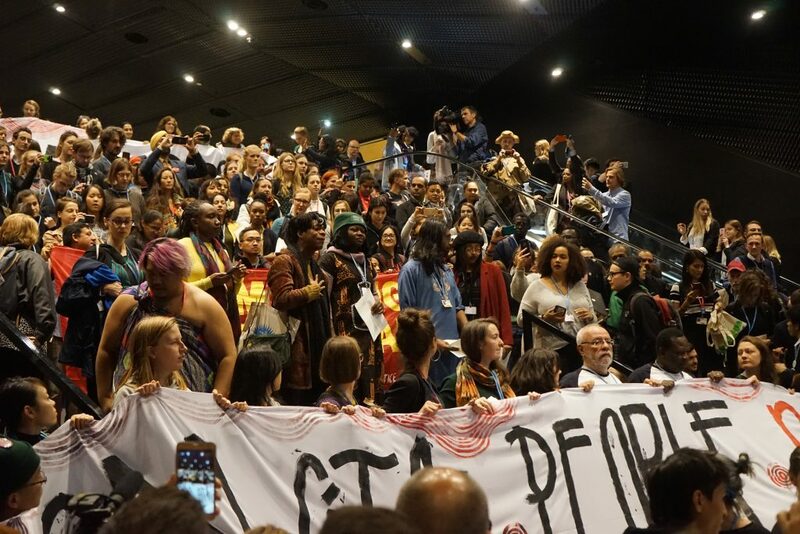 BCCIC > What's New > The Wave > COP24: What happened? Let’s break it down. 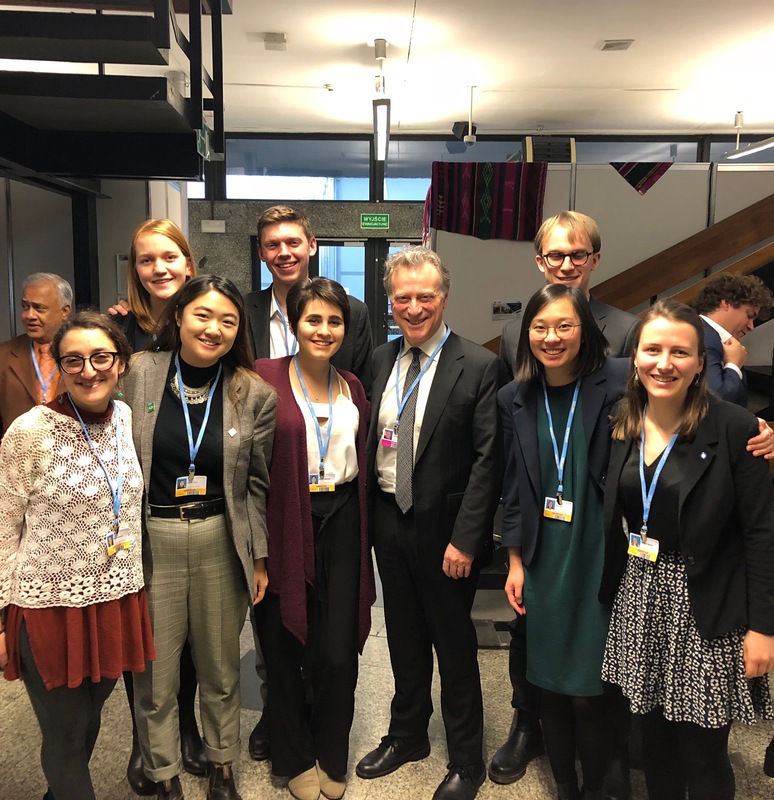 After two long weeks of negotiations, the UN climate change negotiations in Poland (COP24) have ended. The road to the Paris Agreement Work Program was complicated and tense, but an agreement was finally reached. Yet, at this point, the reporting consensus seems to be that while the negotiations did produce a Rulebook, it was not terribly ambitious. But frankly, what does that mean? Behind all of the jargon, the emotional reactions and contested reporting, what actually happened? What are the outcomes, and what does it mean it terms of how far we have come towards addressing climate change on an international scale? I’m going to devote this post to unpacking the results in some detail and do my best to reflect on how the agreements made in Katowice might influence the progress of addressing climate change moving forward. First of all, to reiterate the goals of the COP: the headline need for COP24 was to negotiate a final rulebook that would officially guide countries towards the well-below 2-degree Celsius goal set out by the Paris Agreement (1.5 degrees if possible). Beyond this broad-reaching document, Parties (countries) also needed to discuss raising the ambition of their emissions reductions targets, ratify the Local Communities and Indigenous Peoples’ Platform [2nd link] and assemble further financial commitments towards the $100 billion goal established in 2009 at COP15. The ‘Rulebook’ is shorthand for the ‘Paris Agreement Work Programme’ (or PAWP), the Paris Rulebook or more recently the ‘Katowice Decisions’. For simplicity’s sake, I’ll refer to it as ‘the Rulebook’ for now. While no one expected negotiating the Rulebook to be straightforward, from an observer viewpoint the path to final text was a confusing mess. At the end of the first week, diplomatic talks around specific technical details of the Rulebook text were all but derailed after the US, Russia, Saudi Arabia and Kuwait blocked text ‘welcoming’ the conclusions of the IPCC special report on 1.5 degrees released this fall. Simultaneously, the US and others blocked language recognizing the need to uphold human rights in text relating to climate change adaptation. Progress stalled on multiple fronts. In one session I attended, prompts to discuss the topic of Loss and Damage resulted in four minutes of complete silence. According to some Canadian negotiators our delegation spoke with, the political game is to wait until the last moment to agree. Waiting out the opposition can lead Parties to win last minute-concessions, in other words a common strategy is to play a game of climate chicken. 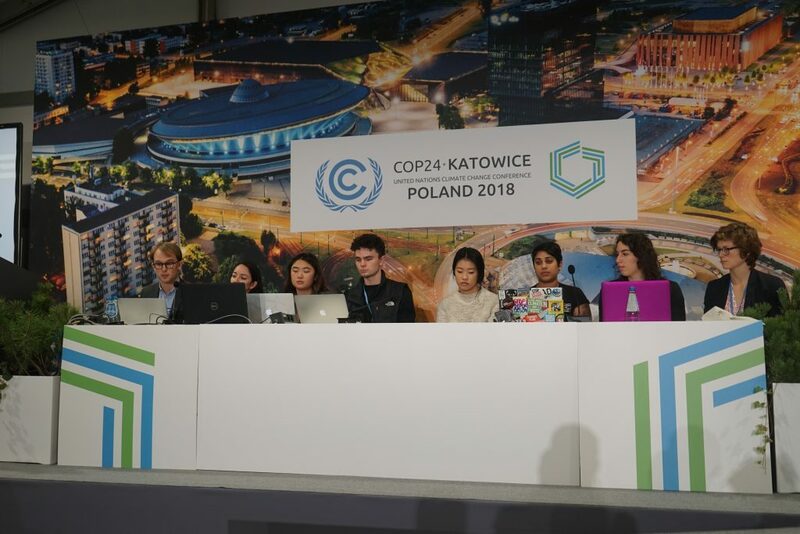 The BCCIC Youth Delegation held press conferences in both the first and second weeks of COP 24 with other Canadian youth. With the arrival of political envoys in the second week, negotiations moved behind closed doors, in the form of informal meetings. The language in draft text for the Rulebook fluctuated quite a bit in both scope and ambition from day to day, in the final jostling for position. In the last two days, Brazil blocked negotiations pertaining to the rules for trading emissions credits (trading these credits internationally allows for countries who are exceeding their emissions reductions targets to receive compensation from countries who are falling behind, essentially shifting emissions from one country to another from an accounting perspective. Brazil supported a loophole that would allow double-counting emissions reductions). 1) A broad set of rules for accounting and communicating finance. However there is still a lack of clarity on some key details. Colton has written an excellent article breaking down the key details and outcomes of the financial negotiations, so I’ll spare you the details here. The important takeaway is that these rules tend to be the same for all countries, rather than applying differently between developed and developing countries. 2) Parties also agreed on common rules for reporting their Nationally Determined Contributions, or NDCs. NDCs encapsulate Parties’ respective commitments to addressing climate change, and common rules are important for effectively comparing and tabulating commitments to measure progress towards the overall goals outlined by the Paris Agreement (further explanation of NDCs here; read Marina’s article on how nature-based solutions should feed into NDCs here) However, while final text says Parties ‘shall’ use the latest guidance from the IPCC in reporting NDCs, it also allows countries to use ‘nationally appropriate methodologies’ which may allow Parties to use creative reporting tactics to overestimate the emissions-reducing effects of their actions. What did they not agree on? 1) As previously mentioned, Parties did not agree on final accounting rules for international emissions trading after 2020, instead moving these discussions to COP25 in 2019. An inability to agree on these rules may also limit private sector investment in climate finance. Brazil’s last-minute pressure paid off for now. 2) They also did not agree to a mechanism to provide financial flows to compensate for damages due to climate change. Referred to as Loss and Damage in article 8 of the Paris Agreement, these financial flows were not mentioned concretely in the final rulebook. While Parties agreed on reporting methods for Loss and Damage, the Loss and Damage finance talks will resume in 2019 with the review of the Warsaw International Mechanism for Loss and Damage. For a more detailed overview of all the final decisions in the Rulebook, see this detailed article. In a COP context, ‘ambition’ refers to the level of action countries commit to addressing climate change, whether it be through regulation, finance, sharing technology or other methods. It’s like your ambition on a soccer field: how much energy and commitment are you willing to put in for the (global) team to achieve its goals? Since the IPCC report [summary], which highlighted the alarming additional consequences of 2 degrees of warming versus 1.5, was released this fall, calls to increase ambition have increased in number and intensity. But throughout COP, ambition remained a highly contentious issue. Launched in 2017 by the Fijian Presidency of COP23, the Talanoa Dialogue, previously dubbed the ‘Facilitative Dialogue’, is a traditional Fijian method of conflict resolution centred on inclusive, participatory and transparent dialogue. “The purpose of Talanoa is to share stories, build empathy and to make wise decisions for the collective good” [more info]. This dialogue convened an open space for countries to discuss where they are, where they want to go, and how they want to get there. Aligning the climate change conversation along these common but broad questions helped countries share their local contexts and concerns. While the Talanoa Dialogue doesn’t feed directly into the final Rulebook, it was convened to help encourage countries to increase their ambition. But did this work? While a few Parties, including Canada, signed on to the High Ambition Coalition calling for Parties to revisit their respective commitments to tackling climate change before the end of 2020, Parties as a whole committed to just about the bare minimum that could have been expected from this COP. However, the largest missed opportunities for ambition resulted from three things: (1) failing to ‘welcome’ the IPCC report on 1.5 degrees of warming, (2) lack of financial commitment (see next section), and (3) a failure to come to a consensus on rules for carbon trading. Failing to ‘welcome’ the report’s results means that Parties calling for increased ambition don’t have concrete places to point to in mutually agreed text showing the latest science of climate change and the scope of likely damages. 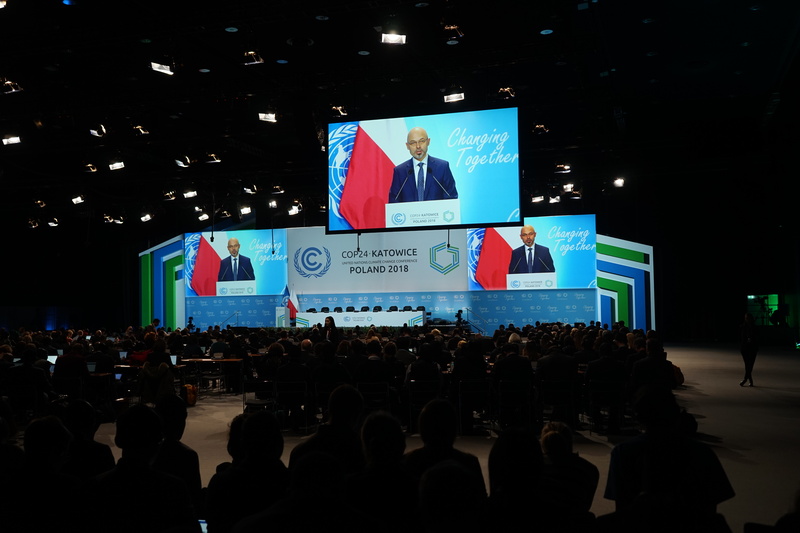 COP24 was also a forum for countries to announce their renewed support for multilateral climate funds. While Germany started off the negotiations strong by announcing it would double its original pre-2020 Green Climate Fund contribution from 700 million euros to 1.4 million euros, other Parties failed to follow its lead (see the finance section below for more detail). Overall the general consensus is that despite the glaring need for more ambitious action, the results of COP24 were just the minimum required to put the Paris Agreement in motion. In other words, we didn’t see an ambitious result from COP24 as a whole. What about finances? How will the countries of the world finance the tackling of climate change in the future? As previously mentioned, the Rulebook outlines the essential accounting rules and procedures for reporting climate finance. However, it doesn’t outline which countries contribute finance when. Countries broadly agreed to reach $100bn USD per year by 2020, but doing so hinges on voluntary contributions. Announcements of further contributions usually come around COP, as developed countries seek to improve their standing during the negotiations. Beyond Germany doubling its original contribution to the Green Climate Fund, the Adaptation Fund has received over $100m to spend in the coming year. Canada has currently pledged $2.65 billion in total climate finance before the end of 2020 but, given the $100 billion goal and Canada’s relative size to other donor Parties, our commitment should be at least $4 billion (or more if we want to throw real weight behind our claims to being climate leaders). Again, see Colton’s article on finance for more details. Indeed, while indigenous communities constitute approximately 5% of global population, they manage 80% of global biodiversity on their traditional lands [source]. The LCIPP finally provides a critical opening for traditional knowledge to influence climate policy at local, regional and international levels. 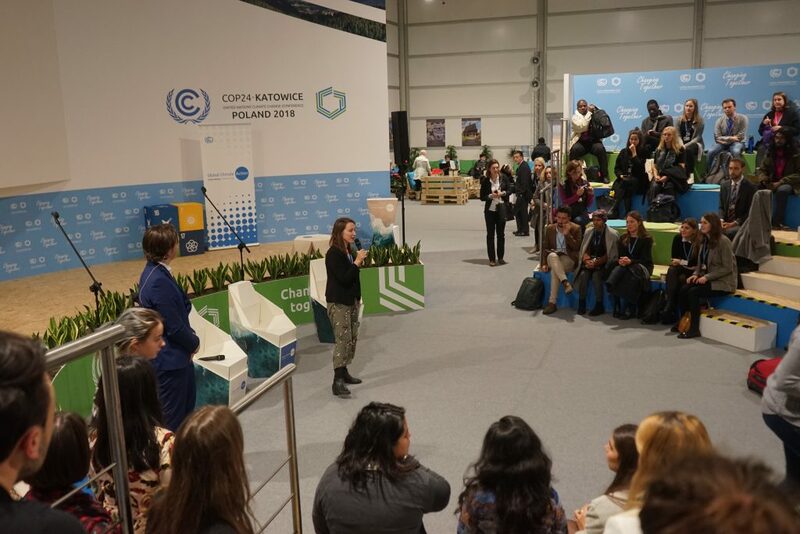 After three years of negotiations beginning after Paris (COP21), the platform finally became officially operational at COP 24 and is designed as a bridge between the United Nations Framework Convention on Climate Change and indigenous and traditional communities through the Subsidiary Body of Scientific and Technological Advice. An important element of the platform agreed upon at COP 24 includes a facilitative working group which will be made up of 14 representatives including 7 country representatives and 7 Indigenous representatives appointed by Indigenous peoples. This is the first time that indigenous representatives chosen by indigenous peoples will have equal standing with states in a UN body. More information on the LCIPP here [NARF] and here [UNFCCC]. Maya has also written a blog post on the LCIPP and indigenous issues at COP here. So, to conclude: where are we now? Where are we going? How do we get there? COP24 is over, but what comes next? What are the consequences of having a global Rulebook for climate action? Ultimately, while the Rulebook provides methods for measuring progress towards addressing climate change and suggests levels of action Parties (countries) need to undertake to limit warming, it is now up to them to take this home and implement it. Limiting warming to 1.5 degrees or even 2 degrees is no more a certainty than it was a month ago. It is now up to Parties to take this document home and implement its suggestions, to engage in difficult conversations with citizens and design action plans that will carry all communities forward into a livable future. Succeeding in this, everywhere, will require broad participation – local, regional, national, and global – and a robust willingness to listen. It will necessitate both creativity and sacrifice from everyone and every sector. It will require individual action, broad buy-in from the private sector and a strong, committed political will. Our situation is not hopeless, but we cannot take it lightly, and none of this will be possible without broad, bottom-up local action complementing top-down initiatives. The BCCIC Youth Delegation met with British Columbia Minister of Environment and Climate Change Strategy, the Honorable George Heyman. BC has recently released its CleanBC plan, the first phase of a new climate change strategy. This is the main vehicle through which our province will play its part in keeping warming to 1.5 degrees. While it is already in motion there is still more to do. We are fortunate that in BC public license and economic and political conditions make ambitious climate policy politically feasible. BC has already shown the way with a decade of effective and progressive carbon taxation, providing a model to Canada and the rest of the world. When telling people at COP I was from BC, a common reply was “oh, you have the carbon tax!” We must make sure BC continues to provide an example of climate policy rooted in action, while meaningfully committing to the UN Declaration on the Rights of Indigenous Peoples. While we have a long way to go on many fronts, we have shown that it is possible to decouple economic growth and emissions increases. It’s now on us to show that it is possible to radically reduce emissions while improving individuals’ livelihoods and well-being, respecting indigenous sovereignty, improving our connecting to the land and protecting remaining biodiversity. 2019 will be an important year for stepping up action on climate change. BC’s climate plan will begin implementation and Canada’s nation-wide price on carbon will come into effect January 1. The federal election next fall will also be an important forum for renewed public debate. As youth, it is critical that we do everything to centre climate change in political discourse moving forward. Send letters to your members of parliament. Lend your voice to those calling for Canada to step up its ambition before 2020. Study how climate change will impact your community if we fail to act. Make art. Research the viewpoints of likely candidates from rival political parties. But also, reach out to friends and family who live in areas still dependent on income from fossil fuels. Find out what they’re worried about and the future they envision for Canada. Lift up the voices of people without an audience. We’re going to need everyone in on this if we want to create a livable, just future.